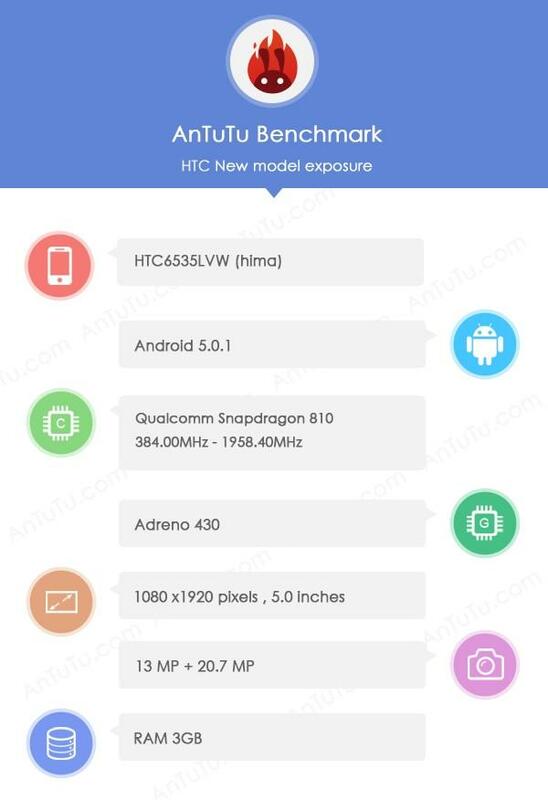 According to a new report based on results from an AnTuTu benchmark test, courtesy of serial leaker @upleaks. The report, which is visible above, seems to back up previously rumors regarding the specifications of the upcoming Hima, including the 5-inch 1080p HD display, the Qualcomm Snapdragon 810 processor under the hood, and Android 5.0.1 Lollipop running under the hood. The Adreno 430 graphics and 3GB of RAM have also apparently been confirmed via the benchmark test. As far as the cameras are concerned, it looks like the Hima could have a 20.7-megapixel camera on the back, with a 13-megapixel camera on the face of the handset. The Hima is shaping up to be a powerful handset, and certainly worthy of HTC’s name, but considering all of this is purely conjecture at this point, we’ll have to wait for HTC to make any official announcements. What do you think of the Hima’s specs so far?